ms Serenity is the four-star "leading lady" in the fleet exclusively chartered by the U.K.-based River Cruise Line, which specializes in affordable cruises throughout Europe. Carrying 190 passengers, the ship has a distinctive claret and cream livery with warm interiors, a panoramic lounge with an outdoor terrace, and a sun deck. The twin-bedded cabins -- no doubles -- are spread over three passenger decks and all measure 134 square feet. Cabins on the lower deck have two small fixed viewing windows, set high in the wall, and those on the middle deck have sliding windows. All the staterooms on the upper Panorama Deck are French balcony cabins with floor-to-ceiling sliding-glass doors. Standard amenities in all cabins are en-suite bathrooms with a shower, air-conditioning, radio, satellite TV, safe and hair dryer. All meals are included in the cruise fare. Passengers have the option of booking a drinks package, which includes selected beers, wines and soft drinks served in the restaurant during lunch and dinner. Daily excursions are not included in the fare and can be scheduled at the time of booking the cruise, or onboard. This is helpful for passengers who want to pick and choose a few excursions in order to spend more time onboard, or want to explore independently during their cruise. 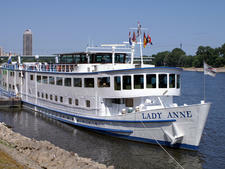 ms Serenity is popular with mature and retired passengers, many of whom cruise with the River Cruise Line year after year. Itineraries all include escorted coach travel from British pick-up points with Channel crossings by ferry or Eurostar. Passengers also have the option to pay a supplement to travel by rail or air, or receive a discount if they opt to make their own travel arrangements. In 2017, the line is increasing the number of U.K. regional flight options with departures from Birmingham, Manchester, Bristol, Glasgow and Aberdeen, in addition to flights already available from Gatwick, Heathrow and Stansted. The ship sails on a variety of itineraries ranging from spring garden tours in Holland and Belgium to a 15-night sailing through seven countries. A new itinerary for 2017 is the 8-night Rhine & Moselle Explorer sailing from Koblenz to Cologne.